As a child, the thought of traveling into space was fascinating to me. Watching live television coverage of a space shuttle filled me with wonder about what was beyond Earth's atmosphere and what it would be like to explore the outer realms of the universe. In Lucy and the Rocket Dog, the main character, Lucy, has a similar fascination, but it is her dog, Laika, who takes a journey into space. Lucy builds her very own spaceship, the Prototype 1, in her backyard. One night, Laika enters it and accidentally launches himself into space. The book alternates between the stories of Lucy, who is heartbroken, and Laika, who, being a dog, is unsure what is happening to him. The story is both an exploration of space and the love that exists between human and pet. There is a lot of science integrated into this book that will interest those who are curious about space. For girls, especially, Lucy is a role model with her love of science and dedication to her passion. This book is also for those who love a good dog story and one with a happy ending. The author provides an author's note at the end of the book explaining a true fact about a dog in space that influenced him in his writing. 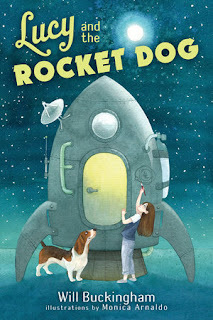 Lucy and the Rocket Dog is a story with adventure and heart. This review is based on an advanced reader copy acquired from the publisher, Random House.